A major restructuring initiative, PAO system is an alternative to archaic system of Treasuries. 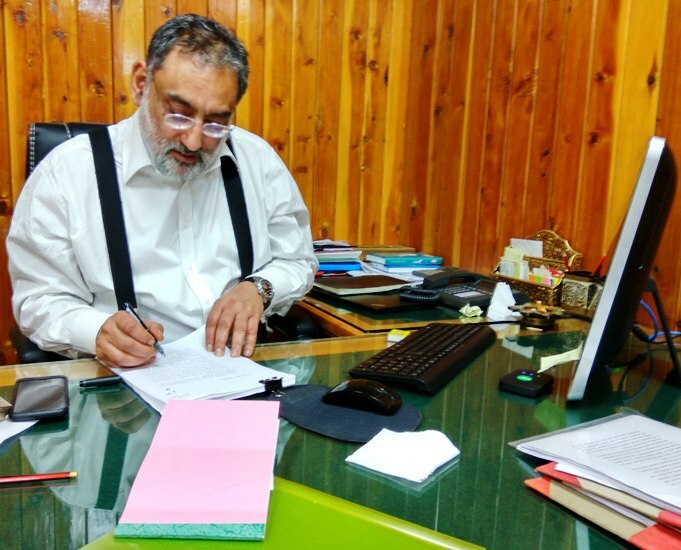 Consigning the treasury system to history was part of 2017-18 budget proposals by Dr Haseeb Drabu.Come winter, huge bundles of budget documents detailing the expenditure of different departments would lose part of the weight, courtesy Pay and Accounts office (PAO) system, the new model being adopted by the government. The otherwise truckloads of books would be easily accessible online and Demand of Grants of various Departments are proposed to be clubbed together for easy understanding of expenditure policy of J&K state. But the new system will not change the records alone. It will completely change the way government pays its bills of contracts and services. Now PAO will credit your bill amount to your bank account and you will never know who processed your bill. The onus of getting the bill cleared within a specific time is with the official for whom you worked. The new system has devoured the very famous ‘drawing and disbursing authority’ of almost all, including the Deputy Commissioner’s who will now be assisted by Payment Advisers. “When we put those 29 grants on table before legislators, nobody looks at them. Let us give those consolidated data into five sectors for easy analysis of how much we spent on what kind of a thing,” Dr Drabu said. “The lawmakers will discuss them in much more meaningful context.” This system will help manage better ratios. Global norm is to spend five percent on education but J&K spends barely one percent.State government spends its entire budget – almost Rs 80,000 crore, under 29 grants. In order to see where the public expenditure is being made, the 29 grants are being grouped into five: Administrative Service, Social Service, Infrastructure Service, Economic Service and Financial Service. Corresponding to this structure, there will be administrative structure. May be in follow up, the five groups will have five most senior bureaucrats or even ministers administering the respective expenditure. But the 29 grants would survive for administrative purposes. The social sector grants will include Social Welfare, Health, Education. Infrastructure grant will include Power, R&B, and PHE. “Everybody must have a career progression,” Drabu. “Earlier, we did in J&K Bank where the senior branch manager goes to a cluster and then to a zone.”Administratively, there will be a Chief Payment Officer under whom would work five Deputies and they will supervise 29 officers who will administer these grants. And there will be the chain at department level following the same pyramid. This, Drabu believes, will end the stagnation in the officials of the soon-to-be-erstwhile Treasury Department. The focus is on making it a department with career progression and specialization. “Let us have only half a dozen people working in secretariat and rest go and work outside,” Drabu said. “Account Assistants, Assistant Accounts Officer, Accounts Officer, let them have different work,” Drabu said. “Let there be sealing on payment as per the levels.” J&K, he said, is expected to spend one lakh crore a year and not every crore bill should go one officer. The treasury was a central point for every government department where revenue was deposited, payments were made and even salary disbursed. Gradually, most of this activity was shifted to banks making Treasury Officerto pass bills only. “With only function to pass the bill, these were becoming gates for corruption,” one senior official said.Treasury, a household name is going to be a history. Housed in a district, Treasuries were basically meant for receiving revenues of government from various departments and also giving payments. There were two main treasuries in capital cities of Srinagar and Jammu known as Saddar Treasuries. Specific to geography, an official in particular treasury would deal with all kinds of bills related to different departments. The larger question is: If work is same, why should a payment officer be restricted to a particular geography? The PAO would check if the bill is right, fulfilling all the codal procedures, and will make the payment.